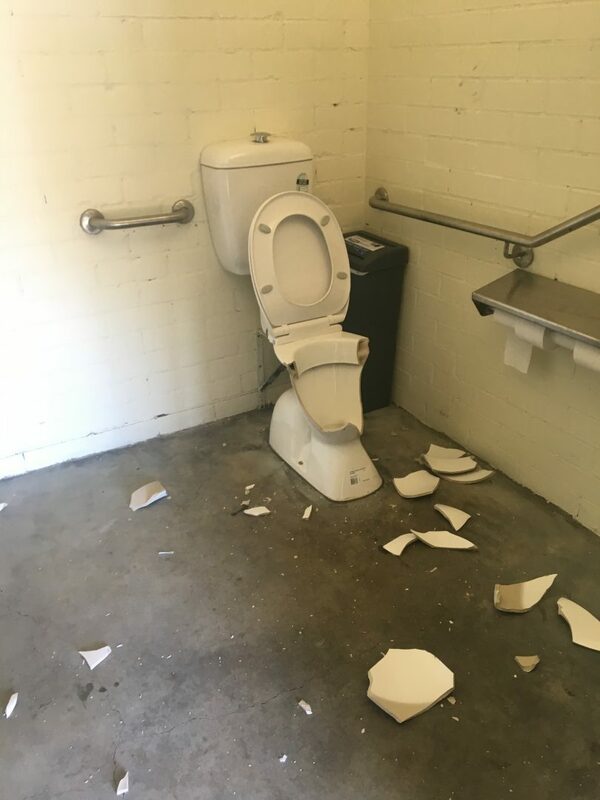 One of the smashed toilets at Calwell District Playing Fields. Photo supplied by Nicole Lawder. 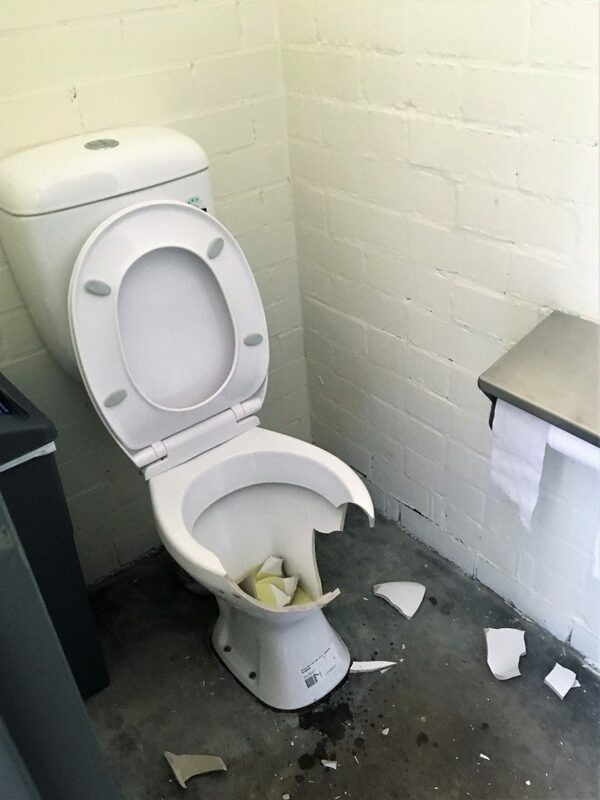 ACT Deputy Opposition Leader Nicole Lawder was disappointed at the “wanton damage” done to a toilet block at the Calwell District Playing Fields on the weekend – with two toilets destroyed, lights smashed and taps left running. Ms Lawder took to social media to lament the vandalism which she encountered during visits to several local sporting fields for grand finals day. “Disappointing when at one of the sporting grounds a constituent called me over to show me the recently vandalised toilet block. Not just destruction of the toilet bowls but taps left running full bore as well as lights broken,” Ms Lawder wrote on Facebook. “Of course I reported it to the ranger immediately but you and I ultimately pay for this sort of wanton damage through our rates and fees and charges. “Not to mention how inconvenient it is for the hundreds of people who might want to use the toilets,” she wrote. The other smashed toilet. Photo supplied by Nicole Lawder. Ms Lawder came across the vandalism last Saturday and believes it was carried out early that morning as the toilets are usually locked overnight. The toilets were in the soccer field area of the playing fields. “Vandalism of this nature is extremely disappointing and should not be tolerated in our community,” Ms Lawder told The RiotACT. Are we seeing too much of this kind of vandalism in Canberra? Could more be done to stop it? Let us know your thoughts in the comments below. And what happens if you’re caught? not much because it’s the ACT. Imposing higher rates and new levies and fines on people who work and actually pay fees/fines is the easier option. You don’t get a decent sentence for horrible acts of animal cruelty, or even murder so you’re probably safe with wanton vandalism as it’s probably considered art by this government. Very surprised to see a ceramic toilet bowl in a public toilet. Public toilets usually have metal toilet bowls for this very reason – to stop them being smashed in vandalism attacks. Should Canberra chase sporting events using Government funding?